Quantum Gateway is payment service that allows US-based businesses to process credit card transactions. The Quantum Gateway for Cart66 Cloud provides a seamless onsite checkout experience where the customer stays on your website throughout the checkout process. Before you can use the Quantum Gateway add-on for Cart66 Cloud, you will need a Quantum Gateway account. Sign-up for a Quantum Gateway account before setting up the Quantum Gateway gateway in Cart66 Cloud. When your Quantum Gateway account is approved and successfully set up, you will need to locate the Quantum Gateway Login and the Restrict Key. To configure Cart66 Cloud to use the Quantum Gateway, login to your Cloud Dashboard and navigate to the Gateways tab here. Search for Quantum in the search bar and it will pull up Quantum. 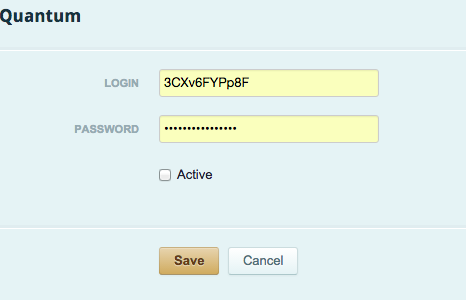 The Login field should be the Login credential from your account and the Password will be the RestrictKey. It is important to note that the password MUST use the RestrictKey. Check the Active checkbox and start accepting payments!